The bhava-chakra (“wheel of becoming,” also referred to as the wheel of samsāra or rebirth) is both a conceptual and visual representation of the Buddhist cosmology, including the interrelated teachings of samsāra, the the Four Noble Truths, the six realms, the three klesha (poisons), the twelve causal links, and spiritual awakening. In essence, bhava-cakra symbolizes the cyclical and impermanent view of life in Buddhism, and shows the root causes of suffering as well as the possibility of liberation (nirvana). In addition to simplifying a potentially confusing set of doctrines, this symbolic diagram also made the Buddha's teachings accessible to the illiterate. The Buddha incorporated many of the religious beliefs of the Brahminical Hinduism that dominated northern India into his own cosmology. One of the fundamental doctrines he kept is the notion of continual rebirth in samsāra until one has attained enlightenment (for Buddhists nirvana or bodhi, for Hindus moksha). Until one's consciousness is freed from this cycle, it wanders from life to life, driven by the karma of previous lifetimes. Far from being a blessing where one has a type of immortality, this cycle is portrayed as filled with suffering and dissatisfaction (dukkha). The harsh nature of life in this cycle is vividly depicted by the creature that holds the wheel in his mouth and claws: Yama, the Lord of Death, who rules over samsāra and calculates where the deceased are reborn based on their previous actions. The hell realm is the worst possible rebirth, where those who committed acts of violence and are dominated by hatred are sent. Buddhist hells are described graphically as having floors of burning coals, air filled with fire, and continual torments such as being pierced with red hot irons. Buddhism is significantly different from the Abrahamic religions in that birth in hell (or any other realm) is not a punishment, but a causal response to previous actions. Furthermore, hell is not an eternal realm in Buddhism, and spending time there is temporary. Once one's negative karma has been burnt off, then it is said that one will be reborn in another realm. The animal realm is said to be where those dominated by ignorance are reborn. This type of rebirth is represented by the image of a pig who charges straight ahead, never looking up, and eating whatever is in front of it. It is said that the life of animals is very similar to that of a human, but they are dominated by fear and aggression without the ability to rise above these feelings. One example would be reborn as a carnivore who is forced to create negative karma through killing other beings because of their karmic and genetic makeup. Birth as a human is considered to be extraordinarily precious by Buddhists because we are capable of overcoming the negative qualities of the lower realms, and are not seduced into the pleasure and false security of asuras and devas, making it the ideal birth for attaining enlightenment. As Sogyal Rinpoche (2002) explains, human birth is valuable because we have “the awareness and intelligence that are the raw materials for enlightenment, and because the very suffering that pervades this human realm is itself the spur to spiritual transformation.” The human realm is described as being dominated by passion for the material, mental, and spiritual. The Buddha cautioned that we must not squander this opportunity for emancipation as birth as a human is exceptionally rare. The asuras are demi-gods who are consumed by jealousy of the devas, who receive the fruits of the celestial tree, while they tend to its roots. In many depictions they are included with the devas (for a total of five realms). Birth as an asura is considered an unfavorable one because of their paranoia and envy, which in turn result in negative karma and rebirth in the lower realms. Devas are the gods of the Hindu pantheon who are capable of performing positive acts, but are more often preoccupied with their pride. Because of their power and long lives, they forget their mortality until they die without warning. Despite the obvious appeal of this realm, the Buddha argued that as humans, we are better able to realize enlightenment because of the experience of suffering, which the devas can ignore. This realm also contains the numerous heavens of Buddhist cosmology, such as Tushita heaven where it is said the Buddha was incarnated previous to becoming Siddhartha Gautama, and where the future Buddha Maitreya is now. This cosmology is often interpreted as a psychological model which explains the various mental states that beings (particularly humans) experience. When viewed this way, heaven and hell, as well as all of the other realms, can be present in us right now. Buddhists argue that what determines the realm we mentally inhabit is not our external circumstances, but our present mind-state. In the center of the bhava-cakra are three animals, the pig, the rooster, and the snake, representing ignorance (avidya or moha), greed (rāga) and hatred (dvesa) respectively. These are the principal negative mind-states that bring about rebirth in one of the lower realms, and are thus referred to as the three kelsha (poisons). The Buddha taught that we accumulate negative karma when we act from any one of these qualities, with hatred being the worst of the three. Like all poisons, these three have their antidotes, which the Buddha prescribed to his followers as keys to liberation (an example of why the Buddha is often thought of as a physician). These meritorious qualities are generosity (dana), loving kindness/compassion (maitri/karuna), and wisdom (prajna, or vidya). In order to generate these wholesome mind-states, the Buddha crafted special meditative practices which typically begin with positive feelings towards friends, then extending them towards those they feel neutrally about, then finally to those towards whom they have negative feelings. Related to the three poisons is the white and black ring around the hub, which shows the ascending path to awakening and the descending path to hell respectively. Buddhas and bodhisattvas guide those on the white path, while those on the black path are lead by demons. The top right image of a blind man with a stick (sometimes leading other blind people) represents the first and most important link—ignorance—which “is not just an absence of knowledge, but is also a consciousness that perceives reality incorrectly.” It was this link that the Buddha targeted with his teachings, arguing that it can be severed through meditative practices that bring about wisdom. He taught that the fundamental error we make in our belief is the conviction in an unchanging, eternal self (atman). Ignorance causes the next link, action, which determines one's rebirth based on the motivation driving that action. This action solidifies into consciousness, which is formed based on previous actions (i.e. those who consistently act based on anger are likely to continue to act that way), which in turn creates name and form—the psychic and physical characteristics we inherit from previous lives. The next thing to occur is the emergence of the six senses (including the “mind’s eye,” which perceives mental formations) that emerge in the womb based on the previous causes (i.e. birth as a human means possessing a different set of senses than birth as a shark or a bat). As the senses mature, they come into contact with their respective sense objects, which brings about feelings about those objects. Some of these objects will be pleasurable, which causes one to grasp for them, leading to attachment. Continuous attachment leads one to the next link, birth, which invariably leads to death, at which point the cycle begins anew. 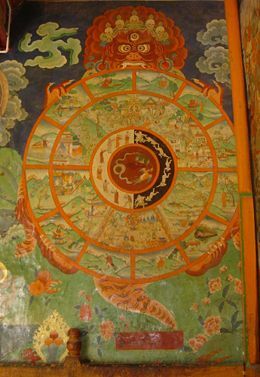 Outside of the wheel of samsāra, typically in the top right corner of the bhava-cakra, stands the Buddha, who is no longer trapped in cyclic existence. He represents the state of nirvana and points to the moon (in some depictions it may be a scroll of text), symbolizing the dharma (the Buddha’s teachings) as the way out of cyclical suffering. The enlightened being inhabits a place higher than the gods, who are still trapped in the clutches of Yama. In fact, Buddhist stories of Siddhartha’s awakening relate that Brahmā, the creator deity in Hinduism, appeared to him and beseeched him not to remain in silence, and to go forth and teach others this path to freedom. ↑ Buddha Dharma Educational Association. ↑ Canadian Tibetan Association of Ontario, 12. Buddha Dharma Education Association. 2002. 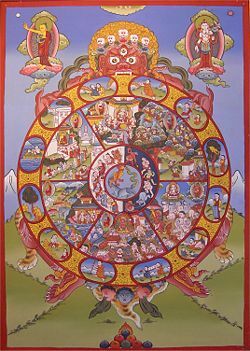 “Interactive Tour of the Buddhist Wheel of Life.” Access date: Dec. 20, 2006. Canadian Tibetan Association of Ontario (CTAO). 2004. Kalachakra 2004: Select Practice Texts in English and Tibetan. Toronto, ON: CTAO. This article began as an original work prepared for New World Encyclopedia and is provided to the public according to the terms of the New World Encyclopedia:Creative Commons CC-by-sa 3.0 License (CC-by-sa), which may be used and disseminated with proper attribution. Any changes made to the original text since then create a derivative work which is also CC-by-sa licensed. To cite this article click here for a list of acceptable citing formats. This page was last modified on 7 July 2008, at 00:54.